When you are on a trip or when you are out for a long time, one of the most terrible things must be that your cell phone is nearly dead and you could hardly find anywhere to charge it. And for vapers, another headache must be that their e-cigarette boxes cannot last long. Although the worry is eliminated to some extent for the new design of e-cigarette boxes with replaceable batteries, vapers need to spend extra money in buying various spare batteries. So where to find an e-cig box that lasts longer and saves money becomes a common concern among vapers. Here comes the Eleaf newly released iPower that may help remove this kind of worries. Not only does the iPower have temperature control and upgradeable firmware like most e-cigarette mods in the market do, it also comes with a built-in battery of 5000mAh capacity that many e-cigarette mods in similar or even bigger size don’t own. Compared to those mods with huge battery capacity, the iPower is much more compact and lighter, allowing easiness in both holding it in hand and carrying it in pocket. Also with a sleek, streamlined looking, it can be gripped with ease and feels pretty comfortable in hand. What does a 5000mAh mod exactly mean? How long can it actually last? Usually battery life is greatly related to a lot of factors including type of tank, setting of wattage, resistance of coil, type of e-juice and use frequency and so on, so it depends. But many reviewers have already tested and come to a result that the iPower can last a remarkably long time of vaping. One reviewer used a 0.5ohm coil in VW mode at 35watts and found the iPower easily lasted him a whole day long. Then what does it mean if you had an e-cigarette mod with such a large battery capacity? It means you neither need to spend more money to purchase a power bank for an e-cigarette mod with built-in battery but low capacity, nor need to purchase lots of spare 18650 or 26650 batteries for a mod with replaceable battery structure. That is, you could always bring it with you without worrying that it would die quickly any more. 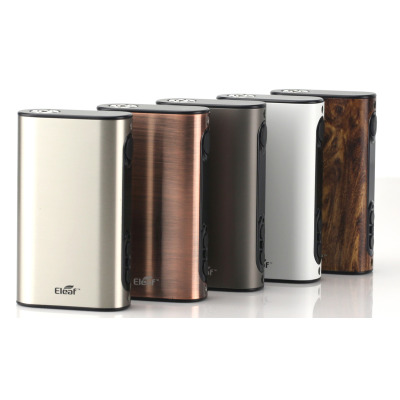 Also the iPower comes in multiple colors for you to choose from: grey, silver, white, bronze and wood grain. The special color of wood grain will surely make it fashionable and unique in your hand. And the iPower is capable of outputting up to 80 watts of power, which can deliver a satisfying amount of vapor and give you a wondering vaping experience. Sleek looking, pretty colors, compact size yet huge capacity make iPower a great e-cigarette mod that all vapers don’t want to miss. 5000mAh makes it much more endurable and sustainable than you could ever imagine. But without having a try, you will never know how amazing it really is. Size: 49.5mm x 23.5mm x 83.5mm. Output Mode: VW/Bypass/Smart/TC(Ni,Ti,SS, TCR-M1, M2, M3). Output Wattage: 1 - 80W. Resistance range: 0.05-1.5ohm (TC modes). Temperature range: 100－315℃/200－600℉ (TC modes).